Fenn underwent the CT Scan today but it could not be completed. There are 3 scans in total to the procedure. She got through the first 2 scans without trouble but then she suddenly started to seizure on the operating table. The emergency veterinarian had to end the scan immediately and stabilize her with anti-seizure medication. Fenn is okay but she will need time to recuperate and fully stabilize before a re-do of the CT scan can take place safely. This is somewhat of a setback but good things did come out of today's ordeal. When the emergency vet conducted his neurological examination prior to the CT scan, he began to get a sense of what might be wrong. The CT scan will give us a definite answer but everything seems to be pointing towards a condition we've never heard of until now. It appears Fenn suffers from something known as Corticosteroid Responsive Tremor Syndrome - a neurological condition wherein any stimulus can trigger the onset of tremors. If this is the case, there is hope for our Fenn! The condition can be controlled with medication. We are beyond grateful to the specialist. Fenn is definitely in good hands. Beagles have a way of pawing their way into our hearts and Fenn is no exception, despite how sick she is right now. The emergency vet is so taken by her that he has offered to conduct the re-do of the CT Scan at no additional cost and will not charge us for boarding her at the hospital while she undergoes this important medical care. There will be additional costs for medication, of course. So we are increasing our fundraising goal to $2,000 to help us through the total expenses. 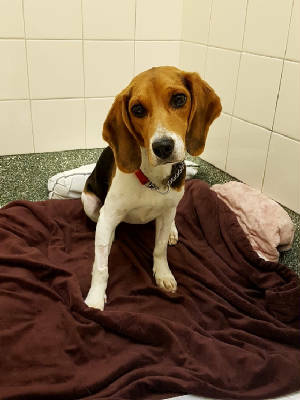 There are other beagles in our care that are pawing at our funding too of course, so this campaign means more than we can say right now. We are just so amazed at the incredible show of support thus far! In just one afternoon, we've raised over $1,200! We have also heard from a few kind souls offering to foster Fenn. Once we know for certain what her health issues are and what her needs will be in a foster home, we can pinpoint the appropriate placement. We encourage anyone to step forward in the meantime. If Fenn does suffer from this syndrome, we will need a fairly laid back, peaceful setting with someone home more often than not to carefully monitor her as we sort through the dosage she will need to keep the condition under control going forward. This is not to say she couldn't share her home with another dog or two but it's probably best they not be too rambunctious for her right now. In time, we're sure Fenn's inner-puppy will start to emerge once she's feeling better! There are moments in Rescue when you don't even have time to exhale. One week ago, this approximately one-year-old beauty arrived at a rural animal shelter. The person who brought her there claimed he didn't know her. The person went on to say she might have been hit by a car. But she didn't have any signs of outward trauma. Being hit by a car seemed rather unlikely. That didn't mean there wasn't anything wrong with her though. Far from it. This beautiful little beagle was having severe full body tremors. Her balance completely off. She fell over easily. Any interaction with her at all could set off the tremors and it seemed to be something far more serious than what fear would ever show. And so, she was rushed to the local veterinary hospital for tests. They ruled out young dog conditions like Parvo and Distemper. No evidence of Epilepsy either or Vestibular Disease which is usually more common in older dogs. It could be that she had ingested something toxic, or perhaps it's a central nervous system issue, or neoplasia. Sadly, it could also be the result of some past head trauma. The vets recommended a CT Scan and possibly a Cerebrospinal Fluid Tap (CBT). Given the fact she's likely been abandoned by her owner, the surgeon kindly offered a reduced flat fee of $1,500. But the shelter couldn't manage that. They'd already incurred what was within their budget and means with the initial tests. And so they reached out to us. With her claim period ending as of midnight last night, we could swing into action and immediately proceed with the CT Scan today. As I write this, our newest rescue case - FENN (Female Emergency No Name) is undergoing this procedure. There are so many unknowns right now, but we had to do this. We had to give her a fighting chance at a long and happy life. Fenn is going to need a trusted and loving foster home to go to possibly as early as tomorrow. But we cannot tell that foster parent what's wrong with her. We don't know yet. And it could be that something unfixable will be discovered and, in that case, she won't come home to us at all. We don't know. Please contact us privately via email if you'd like to foster Fenn. We will get back to every inquiry but your patience is appreciated. This is one of the most serious emergency cases we've ever had and all hands are on deck right now. We're doing the best we can so bear with us. If you'd like to make a donation towards Fenn's medical costs, the link to her special on-line campaign through Canada Helps is provided below. We may be holding our breath right now, but just knowing you are all there right along with us helps more than we can ever express.